The first animals I spotted were my fuzzy antlered friends – the second one was a little more shy. I’m convinced I would have come up with some great quotes by now but it turns out all the good ones have already been recorded and well used. For example take H. L. Mencken’s jewel, “When somebody says it’s not about the money, it’s about the money.” How many times have you heard someone say it’s not about the money during contract negotiations? Yet miraculously more money always seems to solve it. Next time it’s still not about the money – until it is. I’m pretty sure I would have figured out a snappy quote to describe that situation! 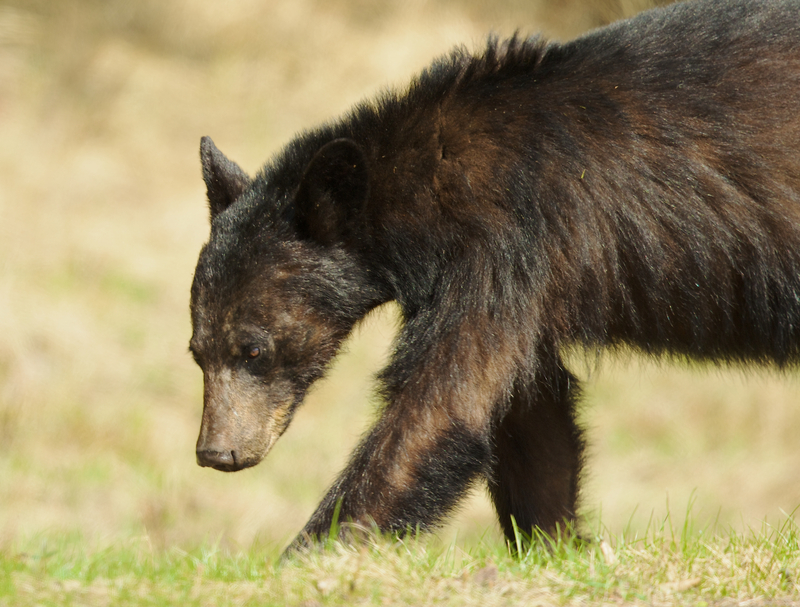 There’s no bear quite like the first one of the season – scruffy or not. My recent trip to northern Saskatchewan followed the same pattern only the entire conversation happened in my head. I told myself I would be happy to get any wildlife or even scenery. After all, I’m an experienced wildlife photographer which is a fancy way of saying that more often then not I don’t find wildlife. I know that I need to keep my expectations in check. It was entirely a coincidence that bears were the first animal I asked about at the information centre. They suggested looking in the early morning and late evening. I think I have memorized their standard response but I keep trying. I was pleased to find some elk, loons and some fantastic scenery in my wanderings. My trip was a success. But I kept driving just in case there were some more … you know … elk. Then at high noon I spotted glimpses of a bear and cubs wandering through thick brush but unfortunately they disappeared without a shot or a trace. Disappointing! A short time later I had a few seconds with a different bear. Euphoria! The next day it happened again. More euphoria! OK I have to confess it really was about the bears. There’s something special about the first bears of the season even if they are not my best bear shots. I will soon be heading back to the Rockies to enjoy the scenery and check if there’s any wildlife or mountains to photograph. Those mountains can be tricky to find sometimes! But I assure you that this time it’s absolutely not about the bears. I bet there’s a famous quote about that too. That’s an interesting shot of the elk! Thanks. I enjoyed lining them up for that shot. The bears are of course dramatic and outstanding shots as well! But I do have to say I’m lovin’ Mr. Elk and his shy friend lurking in the background. I’m happy for you that you got to see and photograph these magnificent animals! I would pass out if I ever saw such cool wildlife and probably get zero photos. I actually really liked the shy friend in the background too. It was nice for the light to hit him as well. Glad you liked these big animals. The image of you passing when you saw these creatures is rather funny but given your photographic reflexes rather unbelievable. I’d love to see what you got with them! Thank you for the first toast on this blog! Hopefully the bears keep wandering across my path – they hold a strange attraction. I believe it was a cinnamon phase black bear. Anytime I see group of cars pulled over taking photos of an animal, there is always that hope – maybe this is a bear? I am not disappointed at all when it is a mama moose deep in the forest or a caribou lazing in the tundra. Who even cares about a bear anyway, I tell myself. The head games we play with ourselves! I too am always excited to see a moose and a caribou would be a welcome first. At Jasper there is this large sign announcing a caribou crossing but I’ve never seen one. I hate it when they make false promises like that! I finally asked someone who said they caribou hadn’t been around for many years. Alaska remains on the photo bucket list. The bears have a strange allure that seems to afflict a lot of people. I’m happy to hear you’re one of them. I still always marvel at the fact that these creatures can wander all over the place and I have been fortunate on occasion to meet them at a certain place and a certain time. They do make a world of difference! I love your bears and said it before. For me, “it’s about the bears.” I enjoyed your story just as much too. Very entertaining. It’s always good to hear from kindred bear lovers. They have a strange allure that renews each spring. I’m happy to hear the story was entertaining. Lyle, Yes, yes, yes. It IS about the bears, and I love ’em. Keep it coming! L.
I dearly hope I can keep them coming. Thanks for the vote of confidence. I keep reading about all the bears in the Rockies where we are going and hoping they stay exactly where they are for a while longer! As I have long suspected – it is all about the bears; and with good reason. I always enjoy your bear shots, though was surprised to see how scruffy they look when first out and about after hibernation. And here I thot I had kept that secret so well over the years! A couple of of months of good eating and that bear will be rounder, much better groomed and looking pretty fine. Years ago I was always trying to find the best specimens of each species but I have come to appreciate the imperfect and different stages more as the years go by. It’s about the bears for me. Even though I know they’re not out to bother me (all but those in Yellowstone), I’m terrified of them. And yet, now that I’ve seen a mom and cub at Yosemite, walking along peacefully, all we visitors instantly in love, clicking and snapping away–all but me, frantically scrabbling through my purse for my phone–it’s all about the bears. I’m happy to hear those wonderful creatures have won you over. But I have to warn you, the addiction can be powerful and cause extra trips. I still have fond memories of the cubs we saw in Yellowstone – amazing little creatures. I experience the same thing, Lyle. Only for me it’s not about the moose. I visit northern Maine each year because it’s beautiful and I have friends there. If I see moose that’s nice but it’s not really about them. Flowers, mountains and even insects….last year a tree frog. Great. No moose no biggie. Now the moose are actually in decline due to winter tick and are scarcer than ever and difficult to find but one still has expectations. So one says that it isn’t about the moose. Too bad about the scarce moose – I get excited about them too. Ah the things we do to protect ourselves but experience is a great teacher. I’m a bit surprised to hear someone else playing the same head games. Glad you enjoyed the post. Yes that little bear will be doing some serious eating! Glad you enjoyed the shots. And yes I most certainly appreciate the comment and like. If no one’s reading I guess it would be more like journaling than blogging. That first scruffy bear does look like he is off in search of a good meal after a long winter! What is the weather like up there now? There’s nothing quite like a long winter to build up an appetite. The weather is right around my sweet spot now with highs in the lower 70sF. I haven’t seen a single bear here in the 10 going on 11 years out west here in Oregon. I saw a lot of them in Connecticut on the east coast. In our part of the Cascade foothills, they tell me not so many bear, but many cougar sightings. One was seen right here in town by our veterinarian. The big cat went through their back yard. I know of a beekeepr who used to keep commercial hives, and was over in the Coastal Range. He said he used to sleep among his hives with a loaded 45. Bears used to make raids on his colonies. The bee club sometimes sent photos around of what a bee yard looks like after a bear raid. They leave a real mess behind! A decade is definitely too long without bears! Though a cougar would be a special first-time event. I can imagine the mess the bears would make! I guess it’s not a myth that bears love honey. I never thot of bee keepers though. Your bears are my raptors. My daughter’s soccer field is near a heavily wooded area and the very first night of practice, a Bald Eagle graced us with an air show. I go to each and every practice now…for the parental joy of watching my child play soccer – it’s not about the eagle. There’s not really a good explanation for the binoculars, though. Raptors are an excellent choice. Great story. I’m coming up blank on good explanations for the binoculars as well but I hope you put them to good use.